The 8-point Juvederm facelift is an advanced method of facial contouring which improves volume, soothes lines and evens out creases to give a youthful and radiant appearance. Using the latest range of Juvederm fillers with vycross TM technology, the 8-point lift can achieve results traditionally expected from a surgical facelift but without the time or cost implications. The results last for up to 18 months and there is no downtime associated with the procedure making it a very popular treatment. As we age, our face begins to lose collagen, elastin and subcutaneous fat, consequently progressive changes are noticed in the form of sagging facial features and loss of volume which in time leads to the formation of lines, wrinkles and folds. The loss of volume also creates areas of flatness and hollows that produce a ‘tired’ and ‘aged’ appearance. 1 & 2. Cheek Structure – the youthful volume and definition in cheeks are progressively lost over time. 3. Tear Troughs – loss of volume in the tear trough area leads to formation of a hollow expression, producing a tired appearance. 5. Mouth Frown – Over time the corners of our lips begin to turn down and become more pronounced. 6. Pre-Jowl Area – downward movement of soft tissue volume on the face due to loss of collagen and elastin leads to the appearance of jowls, giving the face a heavy look. 7. Jawline – the jawline is a smooth line extending from the jaw to the chin which over time looses its definition. 8. Cheek Volume – As we age, loss of volume in the mid-face area can make our cheeks look hollow. In the past, the only method available to address the above concerns would have been a surgical facelift. However, one of the more recent advances involves the use of a combination of dermal filler and wrinkle relaxing injections to gently lift and re-contour the face reducing the appearance of jowls, nose-to-mouth lines, marionette lines, dark shadows and hollow cheeks. We recommend the 8-point Juvederm facelift for anyone over the age of 35, who is showing signs of aging or who has a little skin laxity and volume loss. The procedure is not invasive, but can have a great effect and give long lasting results. 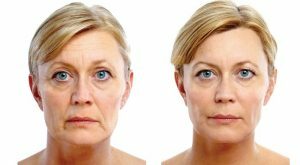 Additionally, if you are concerned about keeping your skin looking and feeling younger in the longer term, the 8 point facelift will help to stop lines from forming and can improve skin’s condition and appearance well into the future. The 8-point lift is the most cost-effective method for achieving full face lift-style results without the need for invasive surgery. For a full and accurate costing, please email [email protected] or call 0207 251 2222 to arrange a free skin consultation. At the consultation we will be able to determine the amount of filler we will require which impacts the final cost of the treatment. During the treatment, we administer Juvederm filler into 8 mapped points on each side of the face. Similarly to when we inject Botox®, you will feel a very small prick as the needle enters, but it is not an uncomfortable sensation. We always use local anaesthetic to minimise any discomfort. As the 8-point Juvederm facelift uses dermal filler injections meaning the effects are immediate. Patients are always surprised just how much difference a few tiny injections can make. Using top brand modern fillers means that most of the time there are minimal or no after-effects. A little short term swelling or bruising is possible and the pin pricks where the injections are placed may show for a few hours. Any visible effects are almost always minimal and can be easily covered with makeup. You can expect to see the effects of your liquid facelift for between 12 and 18 months.